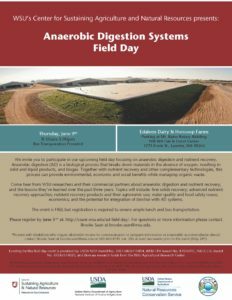 Researchers at Washington State University, working with commercial partners, are hosting an upcoming field day to showcase anaerobic digestion and nutrient recovery technologies and the lessons learned over the past three years. 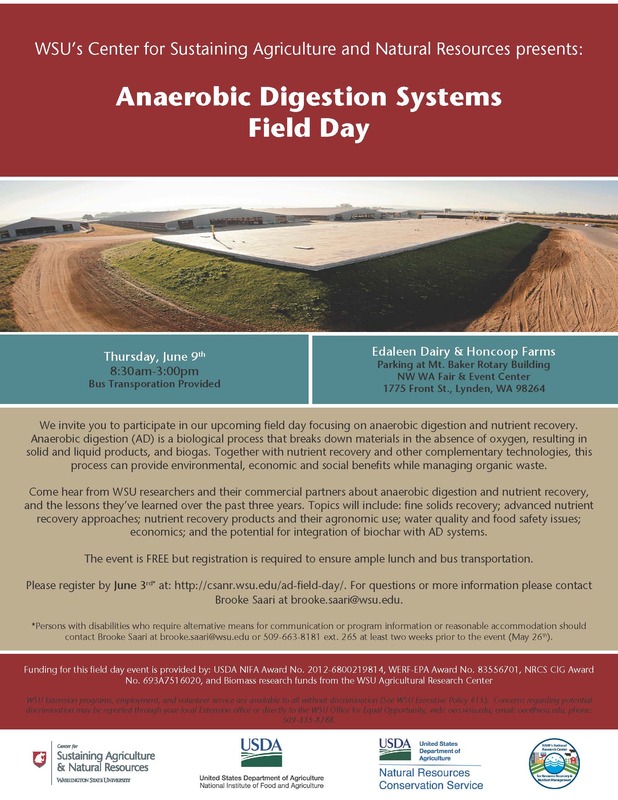 Two farms in Whatcom County that have partnered with WSU and invested in these technologies will open their doors to the public during WSU’s Anaerobic Digestion Systems Field Day on June 9th, 2016 near Lynden, WA. The field day, hosted by WSU’s Center for Sustaining Agriculture and Natural Resources, will showcase various topics including fine solids recovery; advanced nutrient recovery approaches; nutrient recovery products and their agronomic use; water quality and food safety issues; economics; and the potential for integration of biochar with AD systems. The event includes bus transportation to and from the farms, so registration is required. For more information and to register for this event please visit: http://csanr.wsu.edu/ad-field-day/. For a more in depth look at current AD Systems research, watch the latest AD webinar series recorded February through April of this year. This series of five free webinars highlight Washington State University researchers and their collaborators sharing their findings on climate, air, water, nutrient and economic impacts of integrating emerging technologies within anaerobic digestion systems on U.S. dairies. Funding for this field day is provided by USDA NIFA Award No. 2012-6800219814, WERF-EPA Award No. 83556701, NRCS CIG Award No. 693A7516020, and Biomass research funds from the WSU Agricultural Research Center. This entry was posted in Event Announcements, Greenhouse Gas Emissions, Sustainable Practices on May 13, 2016 by AgClimate Admin.